The Swype technology that makes it possible to type without lifting your finger from your Android smartphone or tablet screen has cracked the Windows barrier and is included in the new Windows 7 powered HP Slate 2 Tablet PC. A small, but significant logo sits at the bottom of the screen on the new Windows-powered HP Slate 2 Tablet PC announced today: Swype. Yes, the same Swype utility that lets you type by sliding your finger across your Android smartphone or tablet screen without lifting it has come to Windows 7. The 1.5-pound Windows 7-powered HP Slate 2 Tablet PC (starts at $699) has an 8.9-inch capacitive multitouch display which supports both pen and finger input, a 1.5 GHz Intel Atom Z670 CPU and a preinstalled copy of Swype, which up until now had only been seen on Android, Windows Mobile and Symbian devices. The unit is meant for business and will not be marketed as a consumer device, said Kyle Thornton, category manager for HP Emerging Products at a recent HP press preview in New York. It’s meant for retail and other business uses where full access to Windows applications is needed. It has an SD Card slot for storage in addition to an internal solid state drive and a 3-megapixel digital camera on the rear and a front-facing VGA webcam. According to HP, the battery should last up to six hours on a charge and the unit offers a number of built-in security features, including a TPM (Trusted Platform Module) chip. A dock adds two USB 2.0 ports and a single HDMI port to the unit. 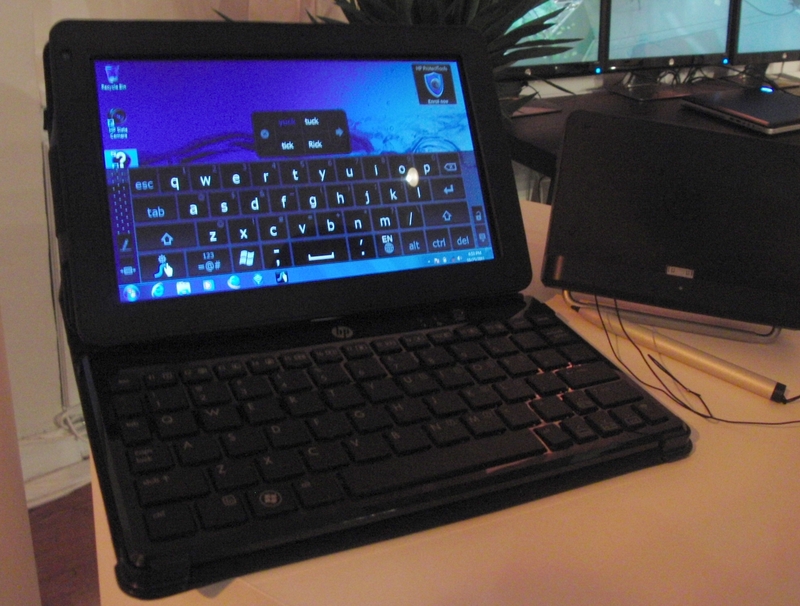 Business-friendly options include the HP Retail Mobile Point of Sale Case, which has a magnetic stripe reader and barcode scanner and the $79 HP Slate Bluetooth Keyboard and Case (above), which folds out to support the slate as if it were a notebook and closes up to protect both the keyboard and the HP Slate 2 Tablet PC. Note that while Swype comes preinstalled on many Android devices, it can also be added to Android devices that didn’t ship with it. Swype Beta is available for download at no charge but does not work on all Android devices, especially those with older versions of Android or have relatively low-resolution displays. (Don’t install Swype Beta on a unit which came with Swype. It won’t work.) 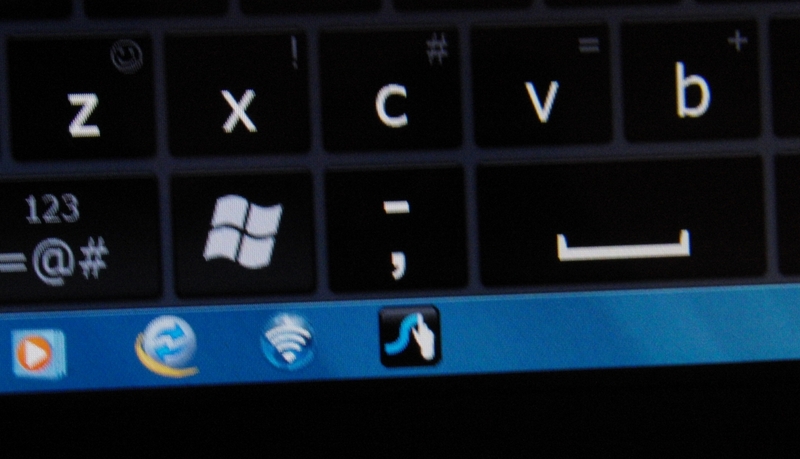 Swype is not available as an separate installable Windows application for other Windows tablets. The HP Slate 2 Tablet PC will ship later this month and will be available from the HP website. This entry was posted in Atom, HP, mobile, new york, tablet, Uncategorized, Windows and tagged Atom, capacative, finger, handheld, HP, HP Slate 2 Tablet PC, Intel, mobile computing, pc, slate, Slate 2, solid state drive, ssd, Swype, Swype for Windows, tablet, Tablet PC, touch, TPM, Windows, Windows 7. Bookmark the permalink. The blog of Robert S. Anthony, personal computing and technology columnist. Anthony, former senior writer at PC Magazine, now writes features for PC World, Black Enterprise, The Network Journal, the New York Daily News and other publications. Send press releases, product information and suggestions to bob@paperpc.com.